Here is a good example of what you could really do with your iPad 2 and Apple's Digital AV Adapter. Firemint's Real Racing 2 HD for the iPad 2 is the first iOS app to take full advantage of the ability to mirror the iPad 2's screen on a larger external display or HD TV using the Digital AV Adapter and an HDMI cable to output native full 1080p resolution without any black bars. 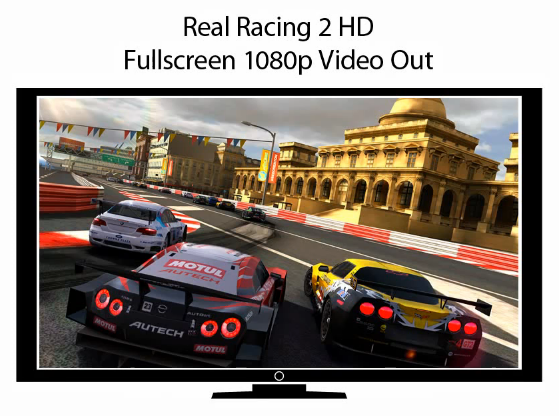 Real Racing 2 HD retains its crisp and gorgeous graphics at full screen 1080p and it will compare with gaming consoles. Your iPad 2 is your controller as well as a full track map and statistic display. The update to enable all of this will be available soon. In the meantime, check out the video below.